Quartz Countertops Pompano Beach, FL Broward and West Palm Stone Supplier attending South Florida for over 10 years. We are specialized in countertop fabrication and installation, we are your one stop shop for Quartz Countertops in Pompano Beach. Kitchen Countertop with Quartz Stone, a lot of people ask if they should choose quartz stone for countertops. Today we’re going to get deep into details about this kind of stone that is still new to many people! Quartz Stone is not a 100% natural stone like granite and marble. It is industrialized, has uniform appearance without veins which makes it sophisticated. It is composed of 94% quartz (mineral contained in granite) and 6% resin, which makes it up to 11 times more resistant than granite, in addition to having antibacterial action as well. Its non-porous surface does not allow liquids to be absorbed, not to mention that its industrialization does not degrade the environment, so it is synonymous with sustainability. 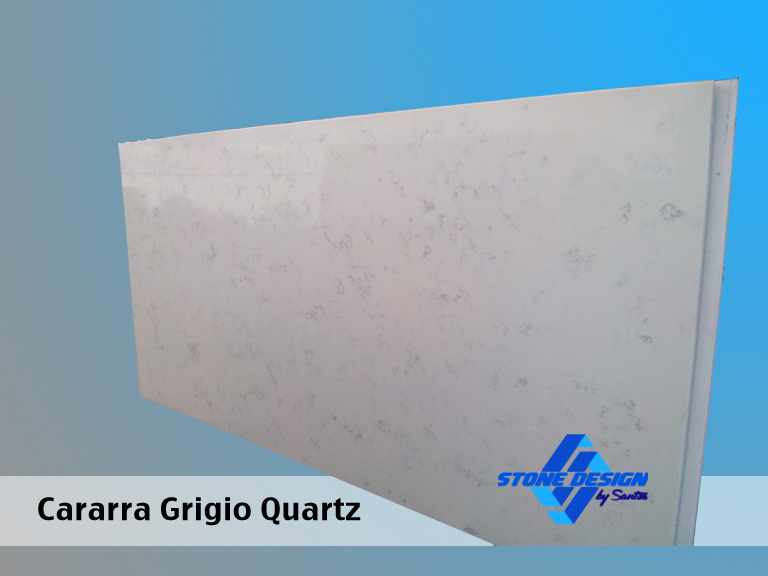 This type of stone does not scratch deeply, so if you grab a fork and pass it on a white quartz countertop like Cararra Grigio, the scratch will appear gray, totally superficial, like if you had scratched with a graphite / pencil. All you have to do is wipe the stone over the edge with a dry sponge, and the risk was gone. However, although this material has been developed for kitchens and the manufacturers state that it is allowed to use knives on it, but you should not abuse. So a good tip is to always use cutting boards when cooking. Quartz Stone can be used on any indoor surface, including kitchen and bathroom countertops, stairs, tubs, floors, walls, desks, offices and many others. For cleaning, it is recommended to use warm water and a neutral detergent, which should be applied to the surface and followed by light polishing with a dry cloth. Taking such care, the surface will retain its luster, beauty and performance for many years. As for using products to remove scratch as I mentioned above in the “fork test”, We do not recommend its constant use, because although the stone is very resistant, some products are more abrasive and over time may end up taking away the protection of the stone. Use only in occasional cases of scratches or small superficial spots that may arise. We provide the support you need to complete your renovation project fast and at very competitive prices. We can help you renovate your table tops, bar tops, bathroom vanity, stone floor, and any project you have. Visit our page Quartz Slabs to see all stone slabs available. 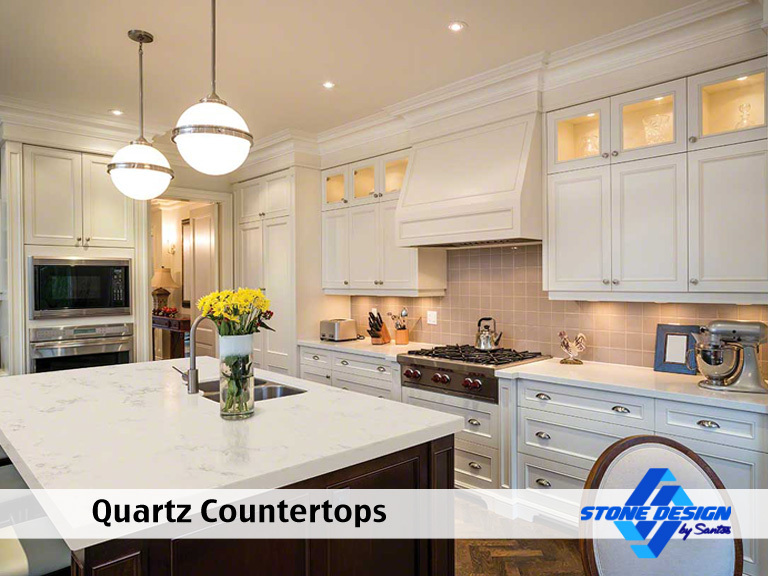 We have the best Quartz selection to choose from, let us help transform you kitchen and make your dream come true. View our latest reviews on Angie’s List or call us at (954) 366-1919 if you are ready to speak with us.